Often times, these are the same people that helped you establish the system requirements in the first place. In this iteration of meetings you are identifying stakeholders and assigning project roles. Collect everyone together who will be providing courses on this new system and determine what they truly need. This team should consist of members from HR (Training department if you have one), IT and Management, to ensure the best possible outcome. You may feel like you accomplished most of this in your search for the right LMS. However, you have learned of new capabilities and new requirements after talking with the team, and you have suggested these new learnings very rapidly to a Gyrus representative. We are here to help, if you need aid in integrating a separate product or developing an API, we’re here for you, and will instruct you on appropriate measures during your administration training session. At Gyrus, as well as in most LMS organizations, we provide in-depth training for our administrators. You do not have to undertake this brand new product without full understanding. We’ll train you on the ins and outs, how to structure interoperability between your other resources, and how to go-live as quickly and effectively as possible. We also are here for you throughout the entire process, if something comes up and you have an immediate question, contact us and we will provide you with an answer. The more you know of the systems capabilities, the more you will be able to get out of the system and the more ROI you will be able to obtain. Be sure to include all of your supplemental materials, not just the eLearnings. We want you to be able to get the most out of your LMS experience from day 1. This is a process you can either do yourself through a content authoring tool, or Gyrus can do this for you for an additional charge. The sooner the content is organized, the sooner you will be able to go live and begin to realize the full potential of your investment. Now that you have all of these materials at the ready, it is time to place them in a testing environment. In this configuration, you will find the first instances of your imported employees, clients, and co-workers. Make sure access is granted to all of the members of the LMS team, as this will allow you to have many eyes on the system for verifying the user and record imports, validity of file types, and functionality of previous revisions of eLearnings. You can also optimize bulk email strategy, and assign privileges to users, who may be able to both train and be trained. It is vital to determine the correctness of this information as it will be the backbone to system functionality going forward. Once, your new LMS is showing verified data that you have approved. Your LMS provider will migrate you to a live environment. 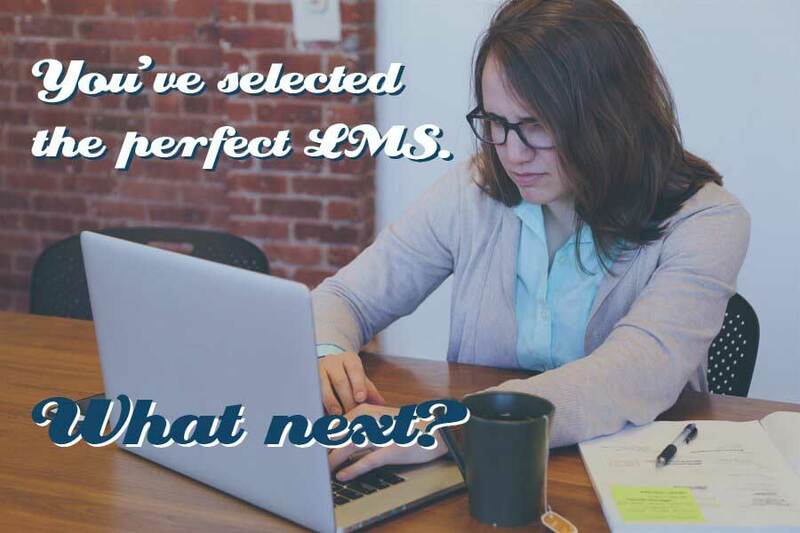 You can breathe a sigh of relief as your hard work has finally paid off, and you have the LMS of your dreams. Be sure to continue your relation with the vendors, write them holiday cards, and contact them whenever a question pops up. At this point, we recommend implementing the new training exercises you have been discussing for months and scheduling away, as your program will take off like it has never done before.